Halloween ornaments, mobiles, toys, and other rustic decorations are just a few ideas for using handmade wooden bat cutouts. They are intended as DIY Halloween decor for kids or crafters to use in making Fall or Halloween decor. 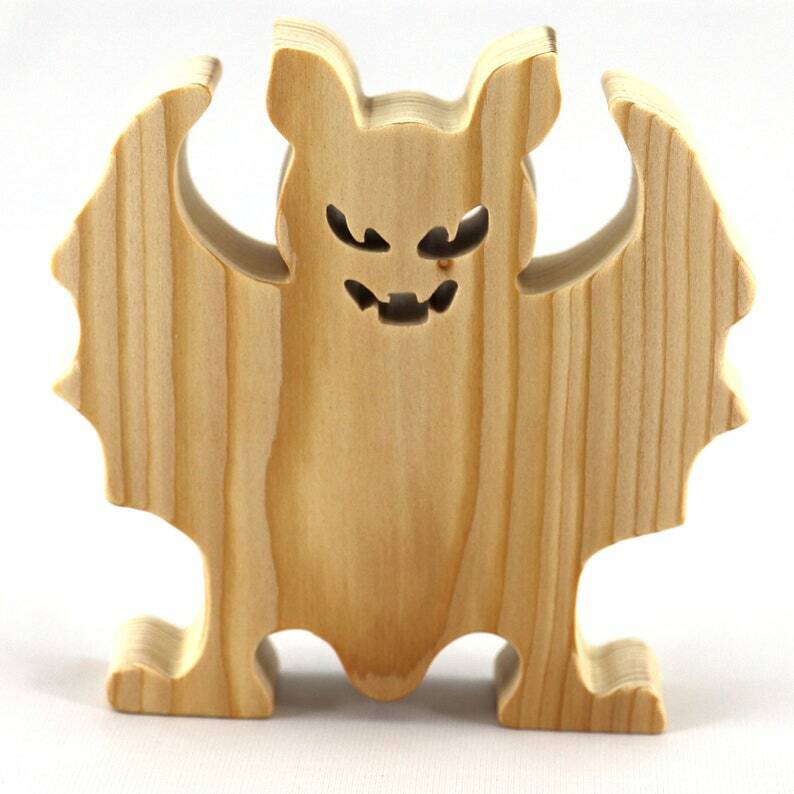 These Halloween Bats make great decorations or ornaments all by themselves or combine them with other Halloween craft items to create a unique decoration. Use several or mix and match with other cutouts and make unique mobiles. I made the first batch of these for my grandson, Odin. He is crazy for anything Halloween related. Some friends saw them and wanted them too. They are great Halloween decorations but, for my grandson they are toys. He builds haunted houses from blocks and uses them for occupants. An unfinished 3/4-inch thick Halloween Bat cut by hand on a scroll saw. It has been lightly sanded with 220 grit sandpaper and is ready to be painted. Can be used as is but the kids always want the colors. Unlike many thinner cutouts, these are freestanding and make good pretend toys. I recommend sealing with shellac before applying craft paint. You can use craft paint without sealing. However, it will require more painting and more sanding to get a smooth finish. If sealed and painted, wooden Bats are safe for outdoor use. These Bats are handmade from real wood. Each piece, even from the same board, is different. The Bat you receive may not look the same as the one in the listing photos. I combine shipping for multiple items and strive to give my customers the lowest rates possible. The more you buy, the lower the cost per item. I refund excess shipping.